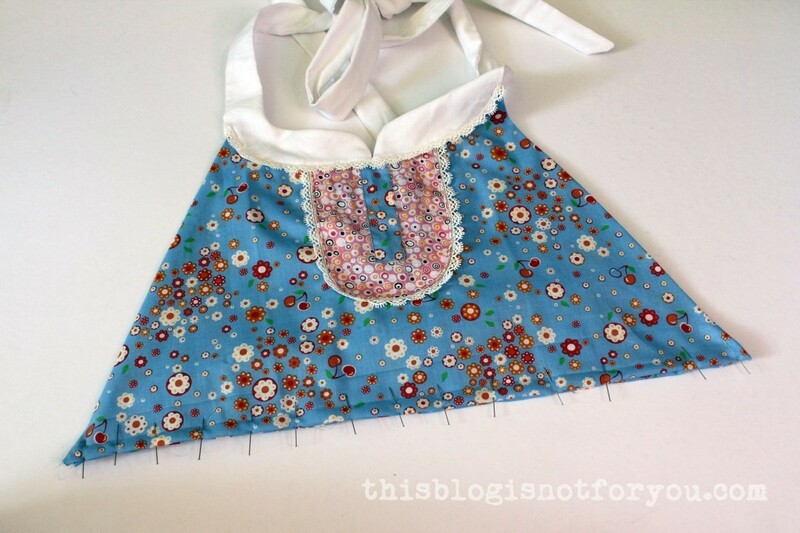 After being a bit ill (and lethargic, blogging-wise) I finally managed to write up the ‘tutorial’ for my Anthro-inspired apron. I use quotation marks because I realised that I actually didn’t take quite as many pictures of the process as my busy brain had imagined. Oooppsi. After choosing my fabrics, I used some black tape (you can also use ribbon and pin it) to mark the lines of the apron on my dressform. 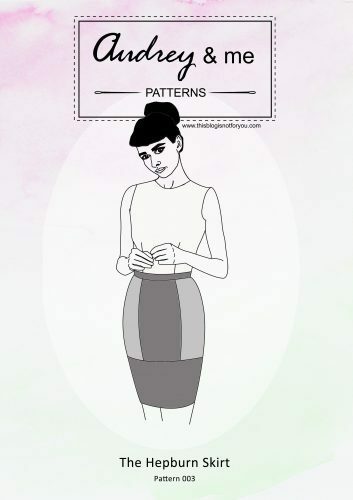 Alternatively, if you do not have a dressform, just draw it on paper and use it as a pattern piece. 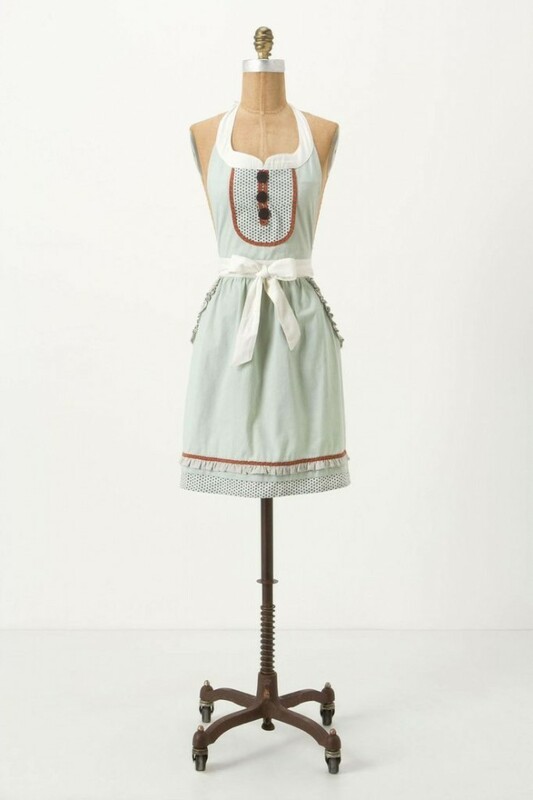 (It’s a kitchen apron, so don’t worry about the perfect fit too much.) I tried to make it very similar to the Anthro-version, as I really loved the shape of the neckline. 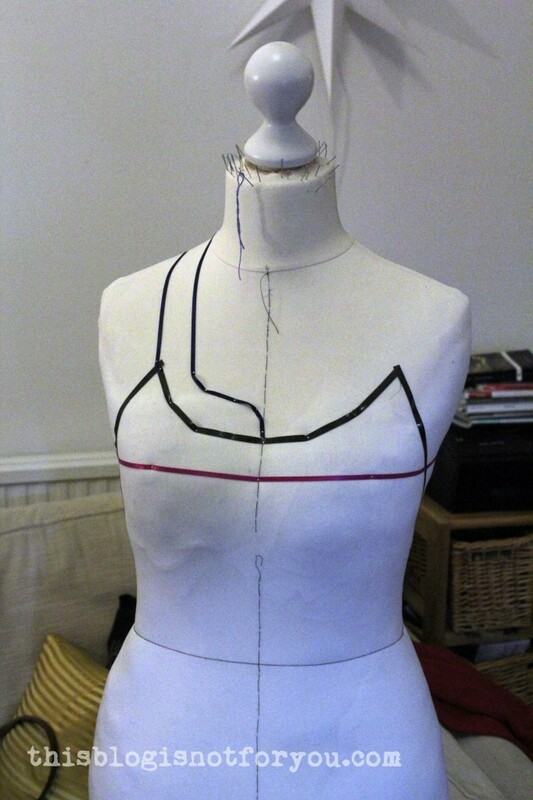 Pinning my fabric (wrong side up) on my dressform, I traced the marked neckline with tailor’s chalk. 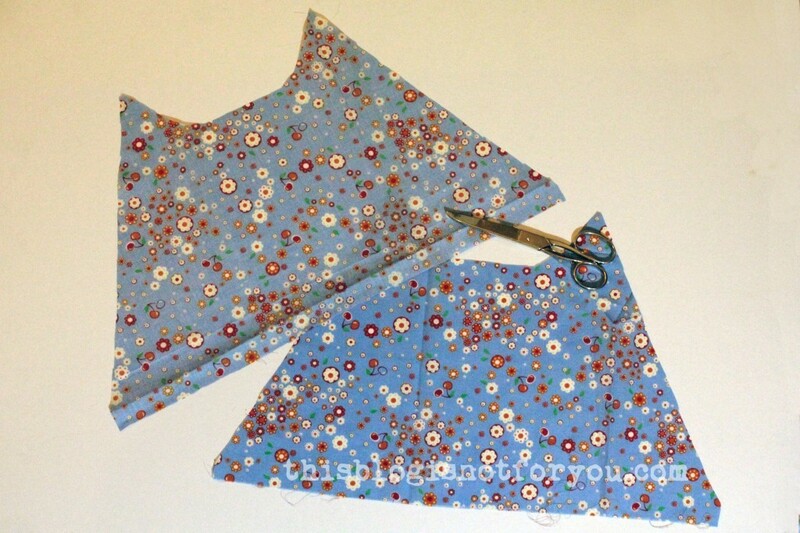 I cut out two pieces, one for lining the bodice (yes, even a kitchen apron appreciates lining). FYI, the side seams of my bodice meet the waistband about 1inch/2.5cm behind where your side seams normally would be (hope that makes sense). 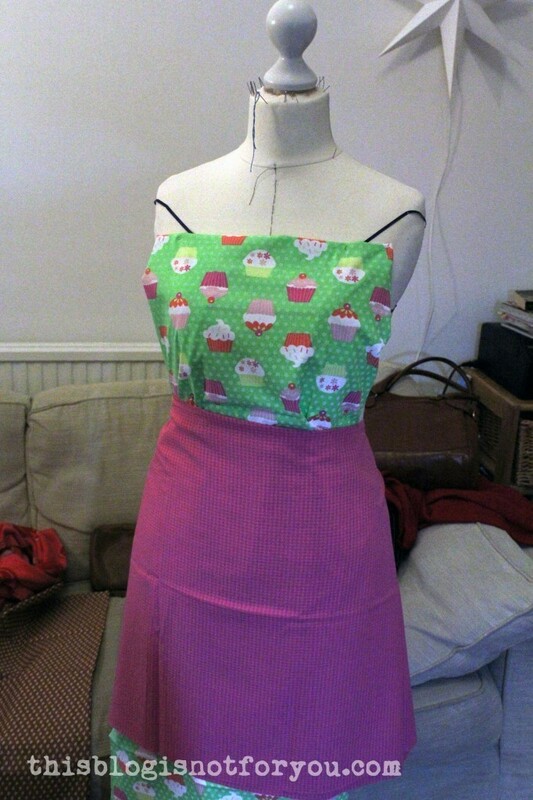 So the bodice part of the apron hugs the body and fits more snugly. Before sewing together the two bodice pieces, all embellishments need to be applied first to get a neat finish. 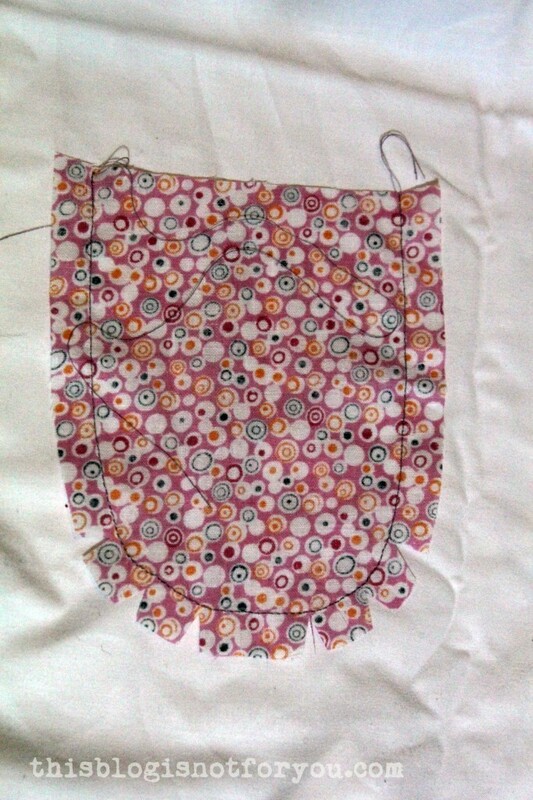 I cut out a bib (don’t forget the seam allowance!). I marked the center on the bib (and also on my bodice piece) with a small notch. I stitched around the bib and clipped the seam allowance. 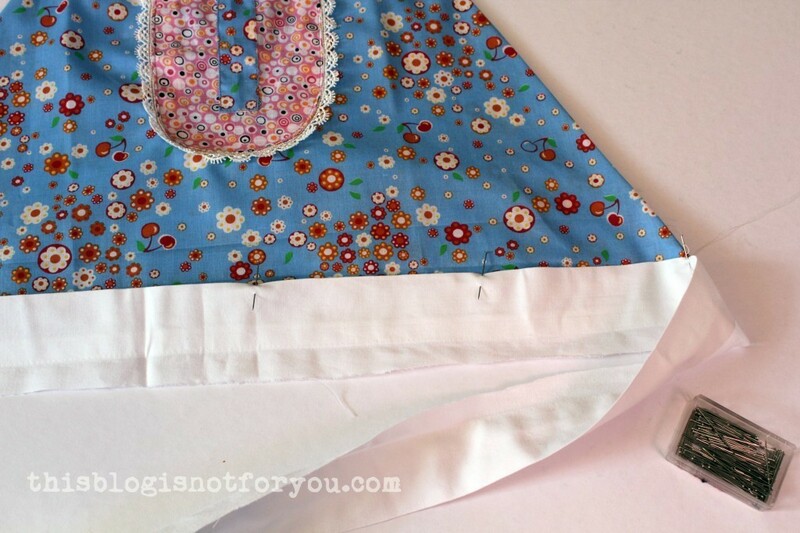 This step helps you to keep the exact shape of the bib when pressing and topstitching. Grab a cup of coffee before we go on – now comes the exciting part. 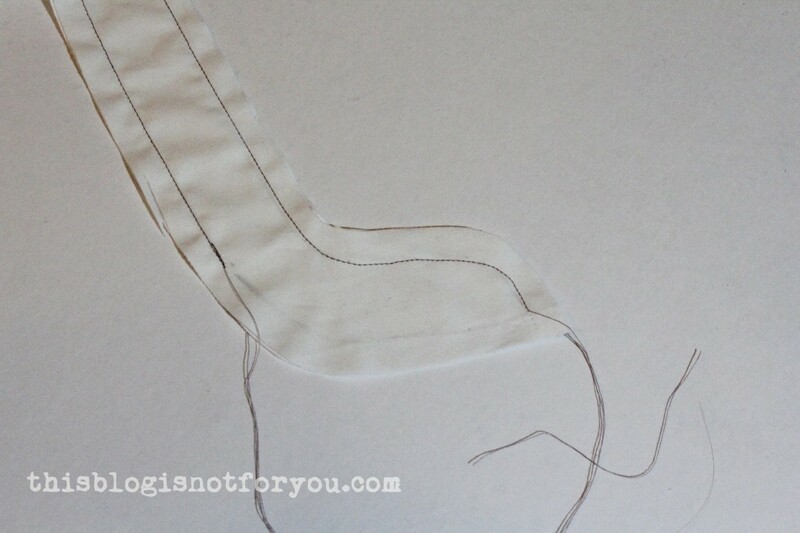 Topstitching (YAY!). Yeahh, I sort of got so excited about the whole topstitching part that I forgot to take pictures of the steps in between. 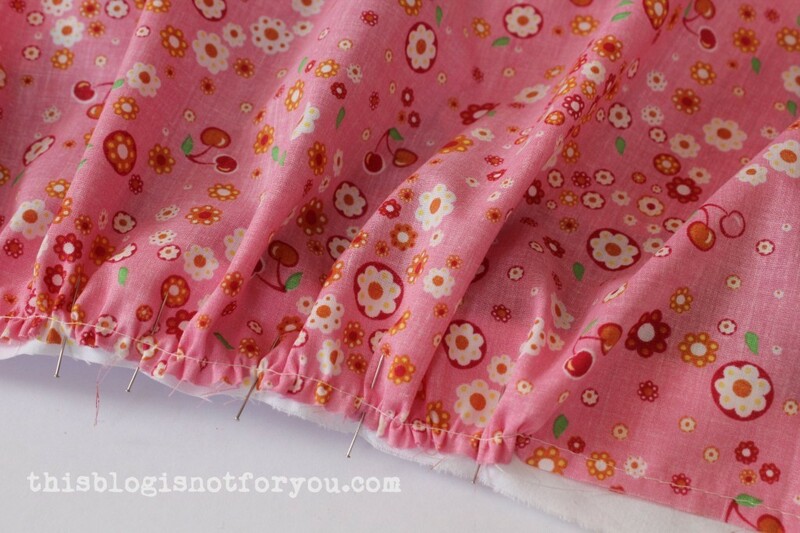 Fold and press the seam allowance of the appliqués first. Align them with the center (important!) and pin/baste them in place. 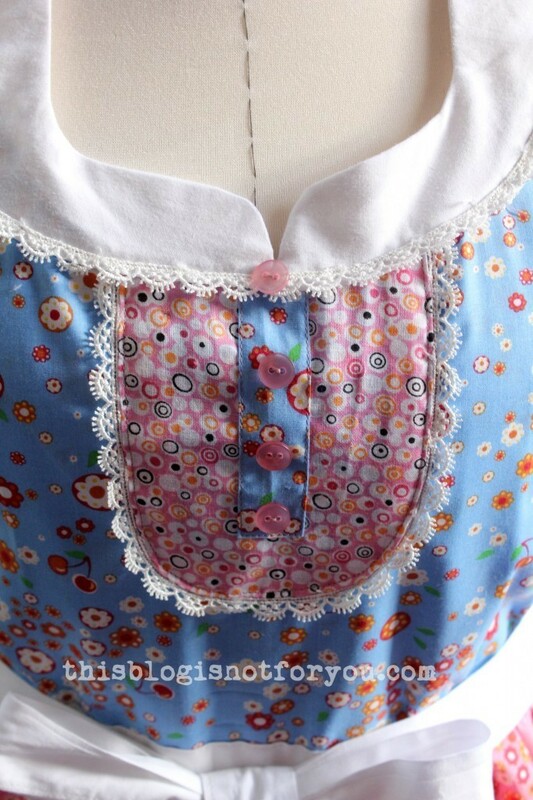 I would recommend handbasting in place, especially when sewing the bib onto the bodice. 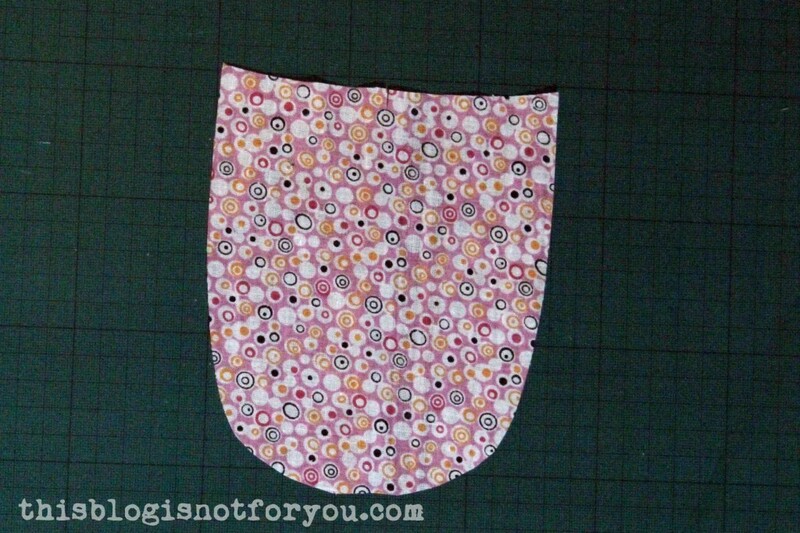 Round shapes are tricky enough to topstitch. 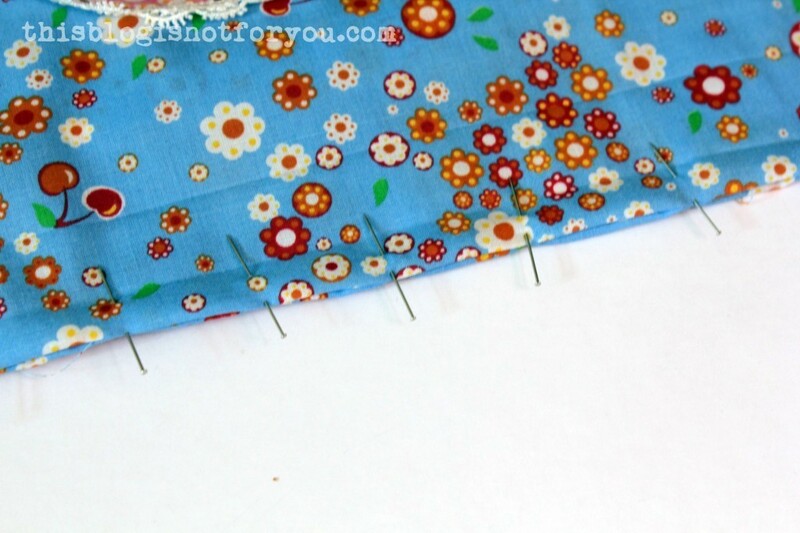 Pins can cause the fabric to be a bit uneven or stretch out of shape. When you baste, the fabric lies completely flat. 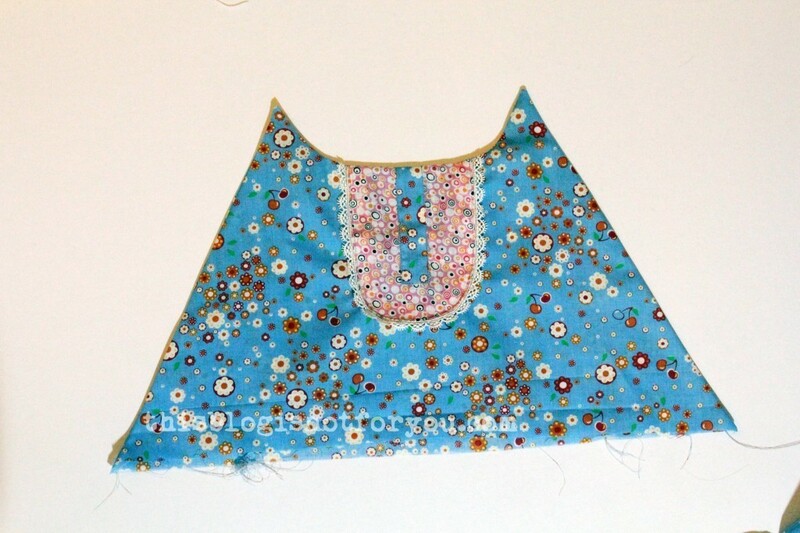 I stitched the faux placket onto the bib first, then topstitched the bib onto the bodice. In a separate step I added some lace trim, stitching very close to my topstitching (I actually used contrasting thread for that). Now it’s time to sew the bodice parts together, stitching around the side seams and neckline. I left the bottom part (where the straps are attached to the bodice) open. 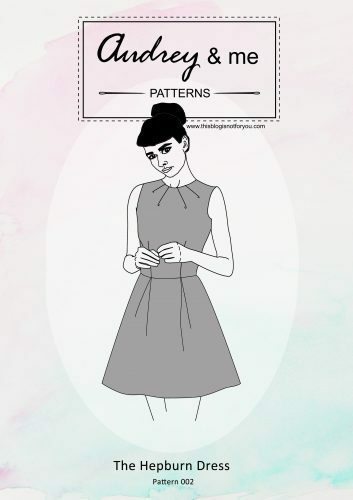 This way you can easily turn the tube inside out and you can use the opening to slip in the top edge of the bodice, then topstitch around the neckline and all the raw edges are neatly hidden. I messed up my topstitching here (probably too much coffee?) and had to unpick twice. In the end that wasn’t even necessary. After adding the trim to the neckline, the topstitching was hidden anyway. Sewing is about the things you don’t see, I know. 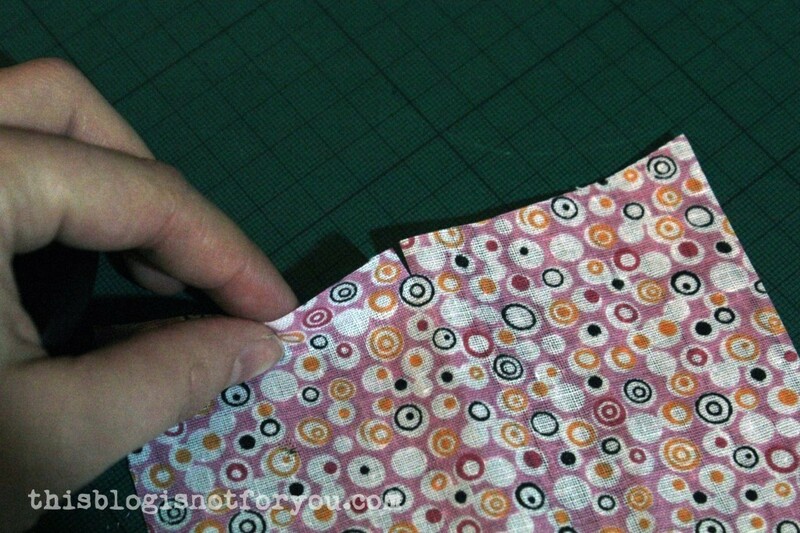 Fold and press the seam allowance of the bottom edge of the bodice. Pin both bodice pieces together (left sides facing) and stitch together close to the edge. I then attached the waistband to the bodice. 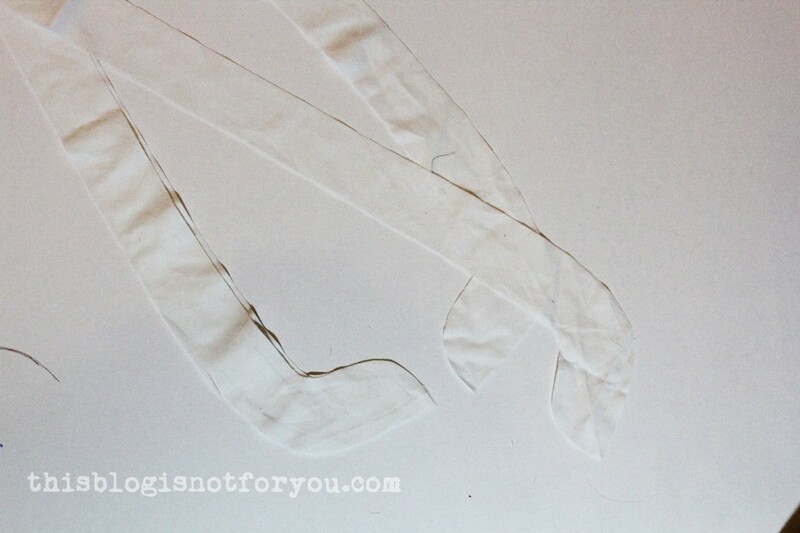 When cutting out the strap/straps for the waistband, make sure it’s long enough to tie it in the front. I basically cut out two waistbands, topstitched together, enclosing the bodice and skirt. This way the apron also looks nicely finished on the wrong side. Before gathering and attaching the skirt panel, I hemmed it and added trim. 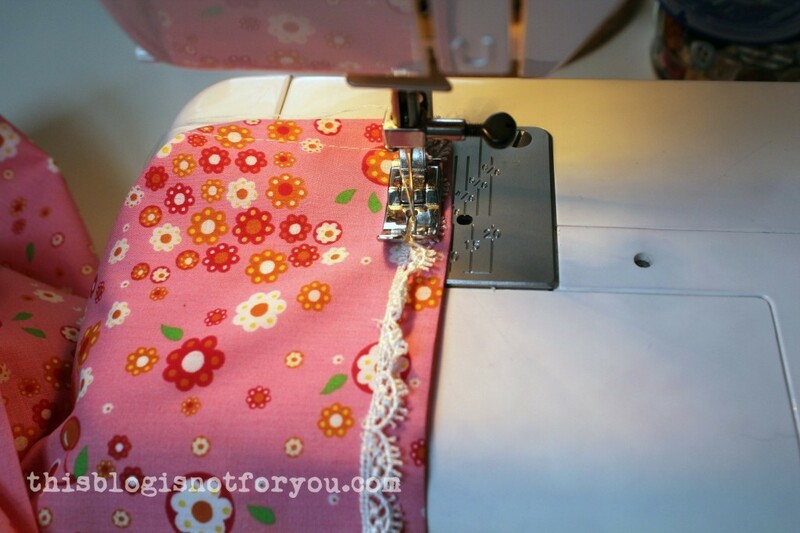 It’s easier to do that when the fabric lies flat. 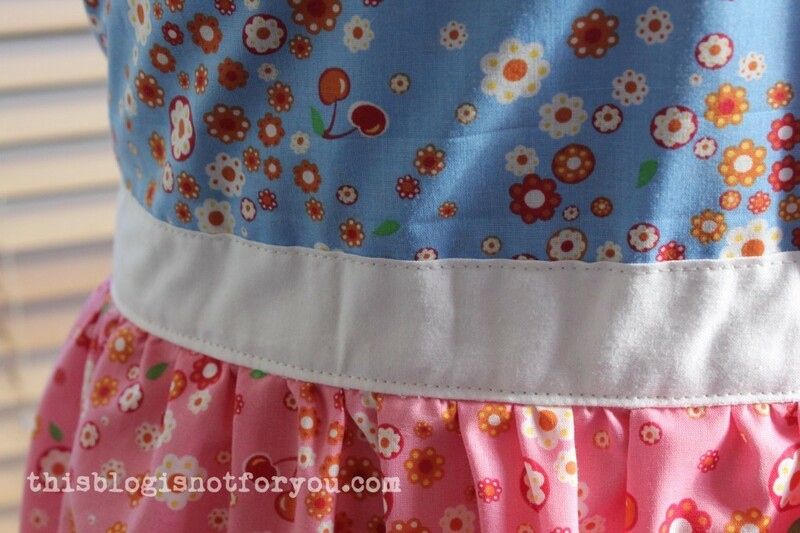 I gathered the skirt panel and sewed it onto the waistband. 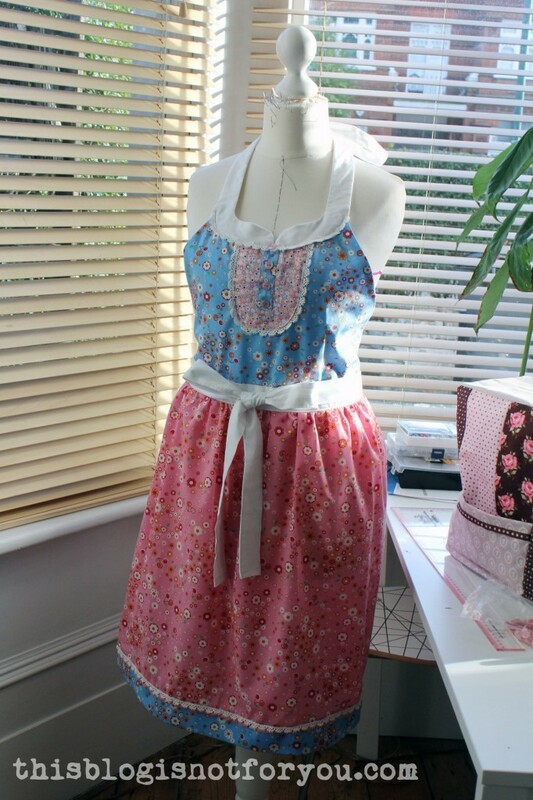 After the apron was finished, I decided to add a ‘second hem’ (is there a name for that?) 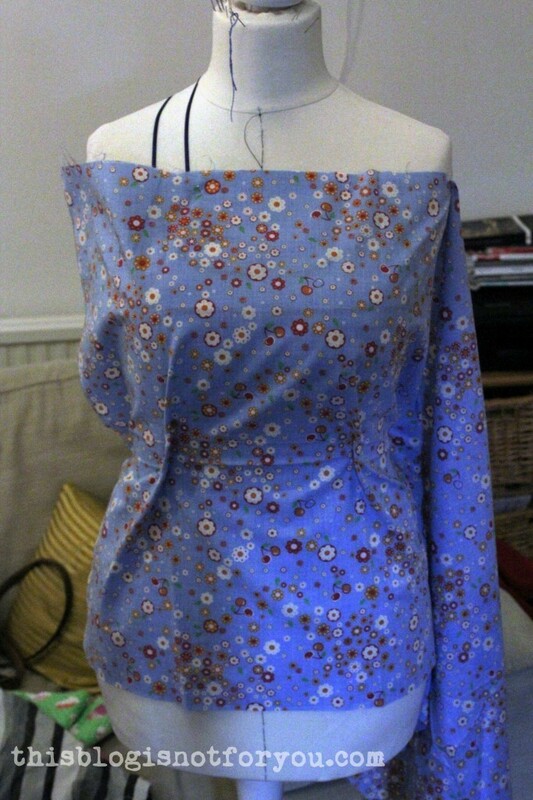 in a contrasting colour/the same fabric I used for the bodice. 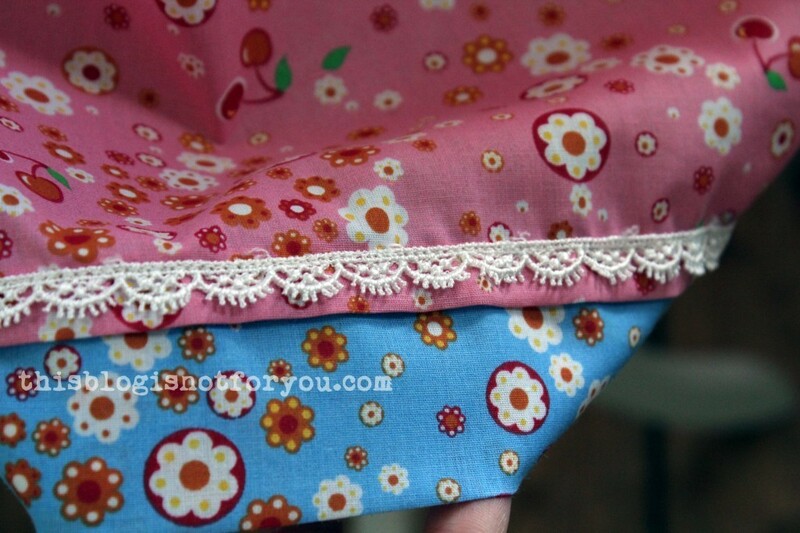 I simply cut out a strip twice as wide as I wanted the hem to be, folded it over in the middle and stitched it onto the skirt, both hems overlapping. And that’s it. I hope my instructions made sense – sorry for the lack of pictures. 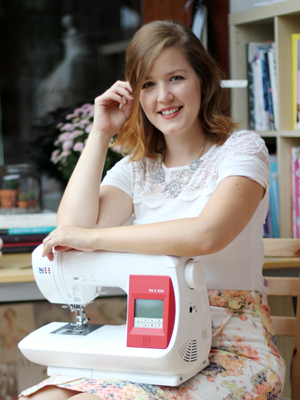 I love the lace around the bib, and the contrasting placket! Very cute!! Wow. I’m impressed with your pattern making skills!! 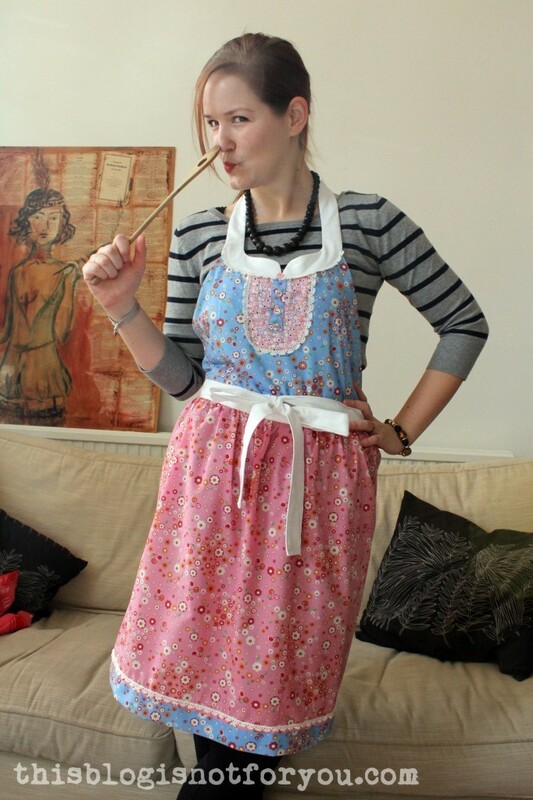 Love, love love the apron.